The mission of the Human Resources Department is to create a strategic partnership with all departments in order to recruit, select, develop and retain our most valuable asset—our employees. 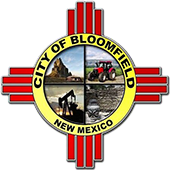 The vision of the Human Resources Department is to provide innovative and practical human resource solutions that enable the City of Bloomfield to develop and serve the community. Monday - Thursday 7 a.m. - 5:30 p.m.
Q : How do I apply for a job? Q: What are the City of Bloomfield employee benefits? Q: How can I become a volunteer for a department in the City? A: You fill out the COB Volunteer Form below. Q: How do I make an appointment with the Human Resources Manager? A: Please call or email the City of Bloomfield Human Resources Department to schedule an appointment. Q: How do I file a grievance? ;; ;;;;;; Click here for Open Positions . PERA is the Public Employee Retirement Association of New Mexico. You are able to find a lot of information concerning your retirement on its website. Here are some easy access links. For all Part-time, Seasonal, and Temporary employees who are not eligible for City benefits, please look into acquiring Be Well New Mexico insurance.